On July 1, 2014, the Federal Trade Commission (“FTC”) announced that it filed a complaint in federal court in Washington state against T-Mobile USA, Inc. relating to overcharges to T-Mobile consumers and cell phone service subscribers. The complaint alleges that through at least December 2013, T-Mobile bilked hundreds of millions of dollars from its cell phone customers by “cramming” hard to identify third-party charges (also known as premium messaging services) on customers’ cell phone bills. T-Mobile is the fourth largest cell phone provider in the United States, boasting over 45 million subscribers. The government alleges that the cell phone service provider ignored a plethora of signs that these charges were unauthorized and continued to bill them to consumers. The complaint states that T-Mobile was or should have been aware of a high volume of consumer complaints, requests for refunds, and even prior governmental investigations into the potentially fraudulent practices of some of these third-party subscription providers. The Federal Trade Commission alleges that in some cases, there were refund rates of up to 40 percent for those subscription premium messaging services. Despite all of the evidence available to T-Mobile that the charges were unauthorized, it continued to include these charges on consumer cell phone bills. According to the FTC, consumers often were unable to identify these charges on their T-Mobile bills due to the way the cell phone service provider listed this information on the bills. The first time the charges appeared on a bill, they were merely listed as “usage charges.” The usage charges were not detailed, until, in some cases, over 100 pages later. This billing practice resulted in many consumers not even realizing they were being charged for these third-party premium messaging services for months, if at all. The FTC alleges that in most cases, the charges were $9.99 per month. Over the course of one year, a consumer could lose over $100 of hard-earned money due to these practices. The FTC also alleges that when consumers did realize they were being fraudulently charged, sometimes for periods of months, T-Mobile refused to issue refunds despite consumers’ requests. 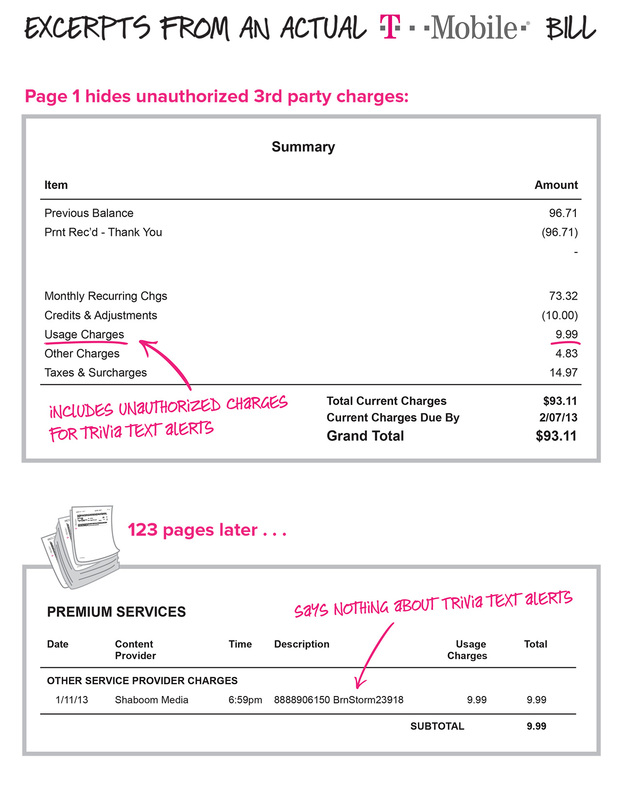 T-Mobile refused to do so even when customers specifically notified T-Mobile the charges were unauthorized. In some cases, T-Mobile required the customer to contact the third-party provider directly, even though the customer notified T-Mobile that the charges were fraudulent, and he or she did not sign up for the third-party services. Many of these third-party messaging services have come under scrutiny, been subject to governmental investigations, or even class action lawsuits. Despite that, in some cases, T-Mobile continued to charge customers these allegedly unauthorized charges for periods of up to one year after federal lawsuits were filed and investigations were launched. A free Facebook application that offered to identify to Facebook users people who viewed their Facebook profiles. Under the auspices of surveying those who signed up for the app, it collected cell phone numbers. The company collecting that information used those cell phone numbers to subscribe users to a recurring premium messaging service, despite the consumers never authorizing that use. A service, WiseMedia, Inc., that placed a charge on consumer bills for sending messages with horoscopes and flirting tips without authorization. A company, Tatto, that used cell phone information collected on its Web site to sign up consumers for third-party subscriptions such as celebrity gossip text alerts without authorization. The FTC reported that it attempted to negotiate a settlement with T-Mobile related to these overcharges, but they could not reach an agreement. The experienced, consumer class action attorneys at Cafferty Clobes Meriwether & Sprengel LLP are investigating these allegations of consumer fraud against T-Mobile and other cell phone service providers. Please contact us if you believe you are a victim of this allegedly fraudulent conduct.